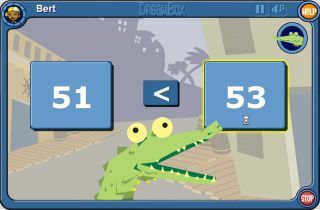 DreamBox Learning K-2 Math is an interactive math curriculum for grades K-2 that is built on a standards-based mathematics curriculum and presented in a fun, adventure-style interactive game. The program presents in-depth math lessons that develop computational fluency, conceptual understanding, and problem-solving ability. DreamBox analyzes a student's individual responses and dynamically customizes the content and sequence for each child. The program keeps track of the student’s progress and remediates and accelerates the student as needed. Pros: The graphics and audio are attractive enough to hold students’ attention for the intended grade level. The vocabulary is also age-level appropriate. The action on the screen will hold the student’s attention, but does not distract from the lesson. The program readily adapts itself to the individual student’s learning style and pace. The areas covered are based on NCTM standards. Students are given continual positive reinforcement as they move through the tasks. The online dashboard is a great standards-based report card on the students progress through the program. Online support provides teachers and parents with tips on how to transfer math skills to everyday life. Progress emails are automatically sent to parents every time the student uses the program. Cons: The program would benefit from some type of administrative module that handled security and reporting for classroom use. Overall Impression: This is a great example of one of the many Web-based learning tools out there. Because it is Web-based, updates can be done automatically so schools can ensure the curriculum is linked to the latest standards.